1. Apple results underwhelm: Shares in Apple (AAPL) are slipping by about 3% premarket and putting a drag on Wall Street after the company reported its first annual sales decline since 2001. The tech giant said Tuesday that annual sales fell to $216 billion in the fiscal year ending September 30, from a record $234 billion a year earlier. The report shows people aren't buying as many iPhones as they did last year. Many analysts have raised concerns that the global smartphone market has become saturated. 2. Chipotle chomp: Chipotle (CMG) shares are also dipping in extended trading after the burrito chain reported sales at existing restaurants are down 22% from a year ago. Customers are avoiding the restaurants in the wake of a nationwide E. coli outbreak. Investors are clearly avoiding the company, too, with shares down about 47% from their all-time high set in mid-2015. 3. Twitter finds a buyer? Shares in Twitter (TWTR) are set to pop at the open as investors hope the influential micro-blogging site may have found a buyer in Disney (DIS). The finance blog Betaville is reporting that the two companies agreed on a takeover price within the last few days. Twitter declined to comment on the report. Disney did not immediately respond to a request for comment. 4. Earnings: A noisy week of corporate earnings rolls on. Boeing (BA), Airbus (EADSF) Coca-Cola (KO), Comcast (CCV), Hilton Hotels (HLT) and Southwest Air (LUV) are just a few of the big companies releasing earnings before the open. Tesla Motors (TSLA), Buffalo Wild Wings (BWLD) and Cheesecake Factory (CAKE) are set to release earnings after the close. Luxury goods company Kering (PPRUY) -- which owns brands like Gucci and Yves Saint Laurent -- is having a good day after reporting strong quarterly numbers on Tuesday afternoon. Kering's stock is rallying by about 7.5% in Europe. 5. Global market overview: There's a lot of weakness in the stock market right now. 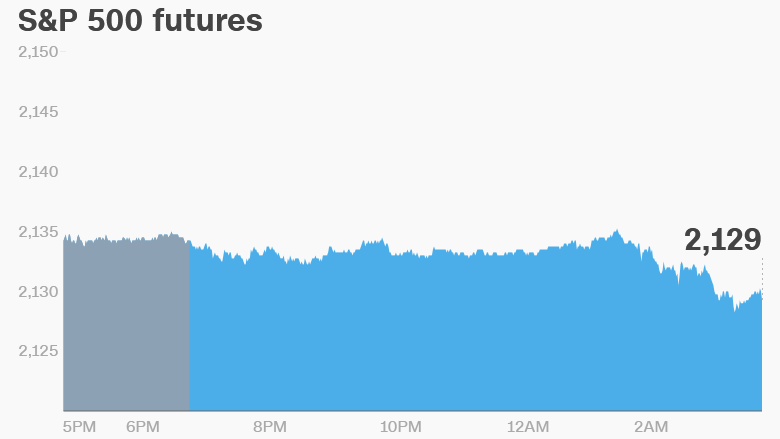 U.S. stock futures are dipping. European markets are declining in early trading, with some indexes down by about 1%. And most Asian markets ended the day with losses. This comes as crude oil futures are down by about 1.5%, trading just below $50. And this follows a down day for Wall Street on Tuesday. The Dow Jones industrial average, S&P 500 and Nasdaq all dipped by 0.3% to 0.5%.